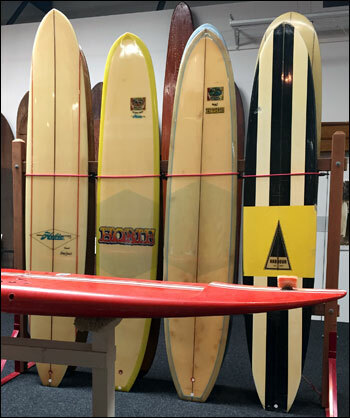 Surfing Heritage & Culture Center: 24 Classic Surfboards Donated! 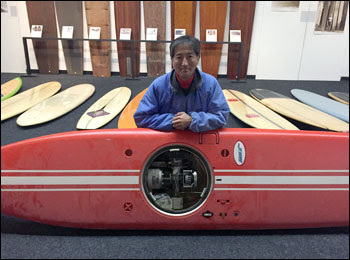 Stan Fuji, former Ventura surf shop owner, donated 24 surfboards and a large fin collection. Included were 3 Morey/Pope Trisects, 3 super clean Hobie Corky Carroll models, a Harbour Banana, a Blue Machine and a mini Blue Machine, a Peck Penetrator, a Hollow WAVE, some cans of Slip Check and a motorized JET board, and more! Thank you Stan, for an amazing collection!